This year we are thrilled to honor New York Road Runners with the Lynden B. Miller Citywide Daffodil Award to recognize them for the success of their first “Planting Marathon” at Open Run locations in each borough last fall, engaging New Yorkers in stewardship of their local open spaces. Read about all the honorees, below. This spring we will see over seven and a half million daffodils blooming throughout our city’s parks, street tree beds, school grounds, and community gardens in all five boroughs thanks to the dedicated volunteers of New Yorkers for Parks’ Daffodil Project who ensure that even after a cold winter, our city’s parks and open spaces will be lush and beautiful come spring. Founded as a tribute of remembrance for 9/11, The Daffodil Project has bloomed into one of our best-loved, longest running programs, engaging tens of thousands of New Yorkers each year. 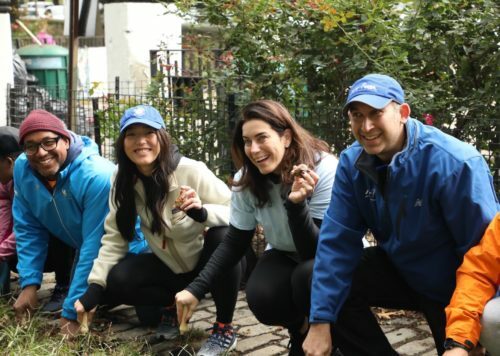 We are thrilled that the number of volunteer participants doubled last fall to over 50,000 New Yorkers planting across the city. NY4P distributes the bulbs and the materials, but it is these dedicated volunteers who truly have made this Project a success. From brightening up community gardens and engaging schoolchildren in beautifying their school grounds, to revitalizing unconventional spaces, this year’s honorees reflect the transformative power of gathering and working together to better a community. Thank you for joining us in celebration of The Daffodil Project and these volunteer leaders who make it possible. Having just completed the celebration of its 60th anniversary, New York Road Runners (NYRR) has been inspiring New Yorkers through running for decades, growing from a local running club to a global champion of the sport of running and its transformative power. As the world’s premier community running organization, NYRR serves people of all ages and abilities, from beginners to professional athletes: the young, seniors, and the underserved. Seeing a synergy between getting New Yorkers running and getting them active in caring for their local parks, NYRR’s Vice President for Government Relations & Community Investment Mike Schnall worked with NY4P, Partnership for Parks, and other local groups to organize the first ever NYRR Daffodil Planting Marathon - organizing daffodil plantings at NYRR Open Runs in parks across the five boroughs. The NYRR Daffodil Planting Marathon not only encouraged runners and walkers to visit new parks, but also inspired them to care for and engage with the spaces they run and walk in. NYRR plans to continue their involvement with The Daffodil Project in the future, and to support other organizations who share their commitment to provide safe and clean spaces for New Yorkers. When Roxanne Delgado noticed trash piling up in her park, she immediately contacted the Parks Department, and soon after launched her first park cleanup. 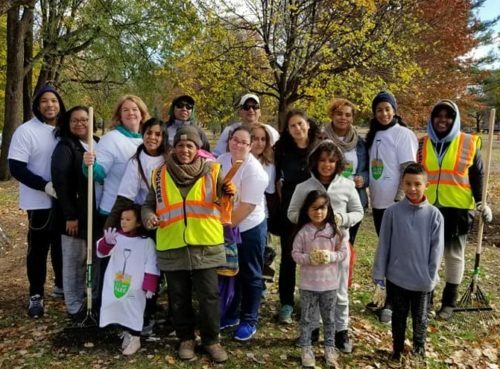 That first gathering sparked the beginning of Friends of Pelham Parkway, a group dedicated to keeping the parkway safe and clean, while simultaneously encouraging park users to develop a love of nature. The Friends became involved with The Daffodil Project shortly after the group was formed in 2017, planting just over 100 daffodils that first year. The Friends group continued to grow, and in 2018, they planted over 1,000 daffodils throughout the parkway, beautifying their local park while teaching volunteers about the importance of caring for local green spaces. In the future, Roxanne hopes that the Friends will provide more educational programming, and help inspire others to create community groups for their own neighborhood parks. Gregory Ingram, East NY 4 Gardens Inc.
Gregory Ingram has lived in East New York for over 50 years, and for 20 of those years, he has been a leader in advocating for and protecting his neighborhood’s parks, gardens, and open spaces. 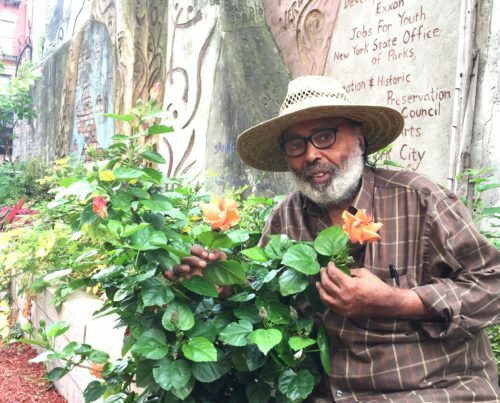 Though many of his peers initially did not understand Gregory’s passion for green spaces, he soon found others who shared his interests and formed East NY 4 Gardens Inc, a nonprofit organization focused on East Brooklyn, East New York, Brownsville, and Canarsie. Gregory and East NY 4 Gardens became involved in The Daffodil Project several years ago, after reading about the Project’s roots as a memorial to 9/11 victims. With the opportunity to honor the lives lost on 9/11 while also beautifying his community and improving his local parks, Gregory and his organization continued participating in The Daffodil Project year after year. In the future, Gregory hopes that with increased funding and community support, East NY 4 Gardens can expand its role in the community, engaging residents through urban horticulture and environmental issues. Betty and Jameel Khan are not new to gardening and beautifying open spaces. Growing up in the lush, green environment of the Caribbean, Betty and Jameel were determined to instill the same values of caring for and protecting the environment in their children. To help better their community and get to know their neighbors, the Khans joined the Baisley Pond Park Block Association. When searching for affordable flowers to plant in their park, the Khans stumbled upon The Daffodil Project, and immediately wanted to get involved. Since 2017, Betty and Jameel have been planting bulbs with their children, Alayna and Raihan, throughout Baisley Pond Park. The Khans hope to increase activities in Baisley Pond Park in the future, and just last year hosted a daffodil planting workshop in the park for their kids’ school. Through these workshops, and planting with their own children, Betty and Jameel hope to teach kids about the importance of being good citizens, giving back to the community, and being a part of something good, lasting, and beautiful for future generations. A lifelong resident of Staten Island, Frank Mascia has always been passionate about nature and green spaces, exploring many local parks and taking his dog on outdoor adventures. When a colleague told him about The Daffodil Project in 2018, he was immediately interested, and requested over 1,000 bulbs. Partnering with four local public elementary schools in Staten Island, Frank organized a day for the students to plant the daffodils in their schoolyards and learn about the importance of open space stewardship and caring for their neighborhood. 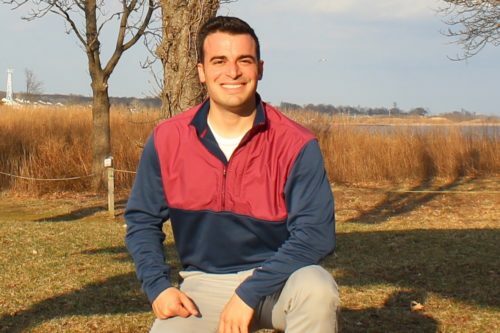 Through his position as Chief of Staff at Council Member Borelli’s office, Frank enjoys being able to make a meaningful difference in people’s lives, particularly in his home borough of Staten Island. Frank hopes to continue his partnership with The Daffodil Project and bring bulbs and environmental education to schools in his community. See pictures from the 2018 Daffodil Breakfast and learn about the honorees. See pictures from the 2017 Daffodil Breakfast and learn about the honorees.